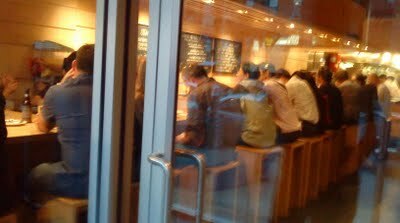 I finally made it to Momofuku Noodle Bar. What has holding me back all this time? Well, for one thing, I’m not big of “asian fusion” or whatever you call it these days. I rather go down to chinatown or ktown and get the real deal for a tiny fraction of the cost. But the main reason I put Momofuku off my list for so long, was because the first 2 times, rite before dinner, huge fights broke out with the guy I was dating, and well dinner became a big bowl of nasty words and tears. So I guess third time really is the charm. 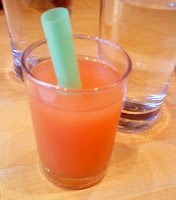 While I waited for my table, I ordered the watermelon lemonade soju slush (the waitress actually explained to me that “soju” is alcohol! *I’m rolling my eyes*) anyways, the slushy machine took forever to freeze, so I waited and waited, when I finally got it, I wished the machine had broken so I could of saved $5. It didn’t have the aroma of watermelon or lemon, it was tart and had some signs of alcohol in it, but also tasted a little bitter. And at that size, it looked more like a shot than a slushy drink. Next were the smoked chicken wings the flavor combo of chili, garlic and scallions is a classic, the chicken fell of the bone and I enjoyed the chard skin and the time they’ve spent under fire. They were good, but not awesome or amazing. Maybe because the flavor profile was too familiar. 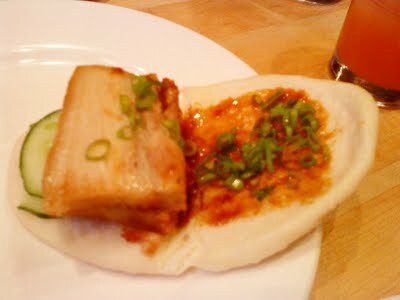 Now his infamous steamed pork buns, the ones that people rave about. I’ll give it to him, they are pretty darn tasty, but how can they not be? Soft, warm and fluffy bun, juicy fatty pork, hoisin sauce, thinly sliced cucumbers and scallions, all flavors I grew up loving, what’s not to like? 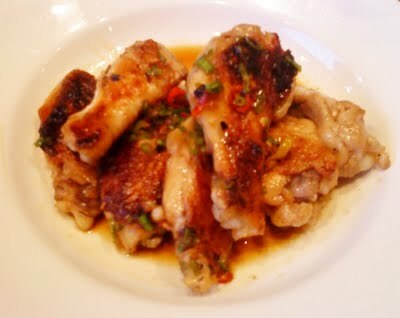 I can see why they’re so popular, but the thing is, I have a Shanghainese mama! yep, this chubby’s mama can cook! 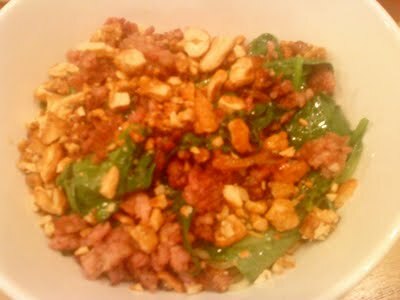 and she does killer pork dishes that can give David’s pork a run for his money any day. So the question is, would I order it again? sure, only because my mama isn’t around all the time. 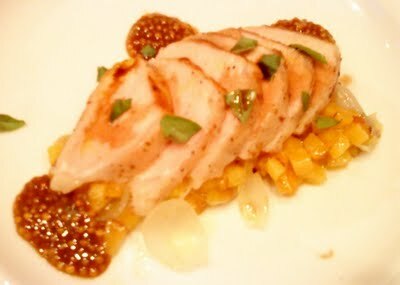 One of the daily specials was Pork Tenderloin with grilled peaches. The waiter lied to my face, telling me how delicious it was. The pork was a bit dry and bland, and the peach with onions had a pickled taste to it and gave the meat a hand in the flavor department, but the most interesting part of the dish was the prune mustard sauce, the little bits of seeds popped in your mouth, which was fun to eat, but it wasn’t enough to save the dish from being less than mediocre. 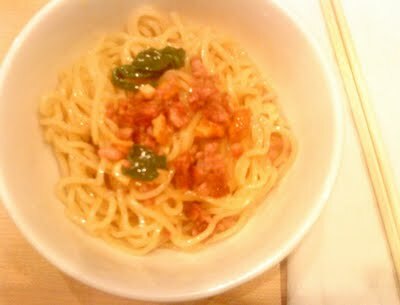 I enjoyed the previous 2 dishes better, this was way overpriced at $19. BUT minutes later, the best part of the meal comes in the form of a bowl. I love Momofuku for the same reasons. Have you been to Ippudo's? If so, I'm looking forward to that post. Sooo interesting. That dish must have been pretty fantastic to make up for the just okay dishes before it. How was it sitting on a backless stool all night? DANG. you had to get through ALL those dishes just for 1 good dish? sigh. Ooo, snap! If you have a family recipe for char siu, I would be so glad if you would post it. I am craving it, and keep trying different recipes, but nothing has scratched the itch.